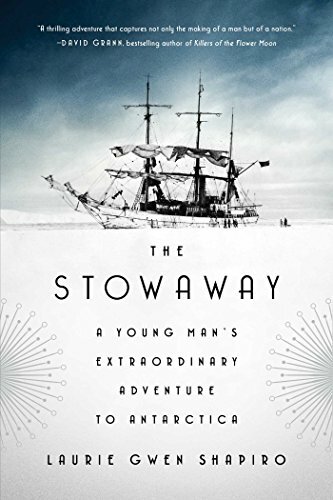 Laurie Gwen Shapiro’s The Stowaway is the adventure of Billy Gawronski, a first-generation Polish-American living in Bayside, New York, who on the day of his graduation from high school attempted to stow away on the flagship of Admiral Richard Byrd’s expedition to Antarctica. Gawronski dove into the Hudson River and swam a mile to Byrd’s City of New York under the cover of darkness. He hid in the hull of the ship for a day. He was routed out by crewmembers and just in his underwear and still slimy from the Hudson he was face to face with his hero Byrd. But his dreams were immediately dashed when the admiral shipped him back to his parents. But Billy ended up on the front page of the New York Times, becoming an overnight media sensation. Billy’s émigré parents were humiliated and furious at their son’s exploits; they wanted him to continue his studies as a textile and interior designer. But these setbacks didn’t stop Billy from trying again—the very next day. He was entranced by the seafaring life depicted in novels by Conrad, Melville, and Jack London. Byrd was commander of several ships, and hundreds of crew and the logistics for a six-month expedition was his attempt to try to upstage other arctic explorers and the lustrous heroism of Charles Lindberg, with an equally historic flight over the South Pole and airdropping an American flag. Billy wasn’t going to give up so and was so obsessed with Byrd’s mission that he turned up repeatedly up at Byrd’s ports of call as expeditions embarked for the South Seas. And eventually Byrd assigned him as a low-level crew member on one of the support ships. The newspapers wanted to follow Billy’s adventures and even published his personal dispatches to his parents in the papers. Billy’s personal journey after his adventures on the seas was just as interesting. He didn’t return to normal life with his parents in New York, but went on a press junket across the country, ending up broke in San Francisco. Having to wire his parents for funds for food and at one point not being about to even afford a room at the YMCA, Billy, always resourceful and in honor of his parents’ support, turned things around as quickly as he could. Laurie Gwen Shapiro is also a documentary filmmaker, and The Stowaway is full of period and historical detail. How she conjures the atmosphere and hardships of seafaring life impresses, but the side stories strike as filler and stall the rhythm of the book. But Billy is a fascinating central character and halfway through The Stowaway picks up steam. Even though Billy’s youthful dream was never fully realized, he was not picked to be one of the over winterers on Antarctica. Those chosen by Byrd as the most essential team for his precarious and dangerous outpost, dubbed “Little America” that including building an underground tunnel city, vehicles, equipment, scientific equipment, and aircraft that would eventually fly Byrd over the South Pole and land him in the history books. Billy continued to pursue professional goals, and Shapiro’s account of his merchant marine career is just as engaging as his youthful exploits. He eventually became the captain of his own ship, literally and figuratively, and even eventually met a woman who would completely change his life.